Your church is healthy if there is quality and consistent participation by more than 20% of your membership in outreach to the community! If you are not reaching out, you have a big problem. Your church is healthy if your congregation is involved and there is participation in leadership. If people are not involved, you have a big problem. Your church is healthy if there is healthy communication and contribution. Grievances are welcomed, discussed, and dealt with in a mutual loving and beneficial way. If there is not effective communication, or if there are hidden dealings (not to betray confidences), you are creating distrust between your people and your leadership, and you have a big problem. Your church is healthy if there is an attitude of servant leadership and mutual respect. If you are not honoring, equipping, and encouraging one another by modeling Christ, you have a big problem (Prov. 27:17-18)! Your church is healthy if it is a place where people, both visitors and members, feel welcomed. People can be facilitated to learn and grow where hospitality is extended, where there is no favoritism or prejudice, and where the Fruits of the Spirit are in operation. If your church is not bearing Fruit, you have a big problem. Got love? Your church is healthy if you are loving, caring, and concerned for the members and the community. If you do not love, you have a big, big problem! Your church is healthy if you are reaching out to the youth with good programming and quality discipleship. If the youth are not welcomed, then Christ is not welcomed! Your church is healthy if people are going to services to worship Christ. You do not want to see people going to church only out of obligation, habit, or family pressures. We come together to learn of Christ, to honor Him, and allow Him into our lives. Allow Christ to intrude even where you do not want Him to. If your church is not Christ-centered and your leadership is not Christ-centered, you have a big problem. You are not a church; and to be more precise, you are just a club! This indicates the replacing of biblical thinking and teaching with the latest trends in church growth, or ministry models that are not Christ-centered. This can come from outright rejection of His Lordship to a weakening of it, such as liberalism. And, it usually comes in to the Conservative Evangelical and Reformed churches as embarrassment to proclaim Him boldly, or as the embracing of weak ministry models. Perhaps, we fear reprisal from liberal-minded people, or even misguided fellow Christians, if we are fundamental (as in from convictions with his Truth) in our approach. So, we keep to ourselves and no one knows who we are either at work or in our own families. His Way is not being lived out. This also comes to us by our thinking that we are being relevant and accepting, when we are actually betraying his Lordship. Yes, we can be relevant and not compromise! We are to be real and accepting but not compromising; a line must be drawn to which we must be held. If this is not so in the leadership, they must be stepped down, then trained and discipled. The leadership must set the example to model His Way in humility, servant hood, and in the boldness to exercise discipline when necessary. There is never a call to be offensive to others; rather, we are to be bold in His Fruit. Make sure, if you follow any models or trends, that they are biblical and not compromising or you will have a Church of Perfidy! 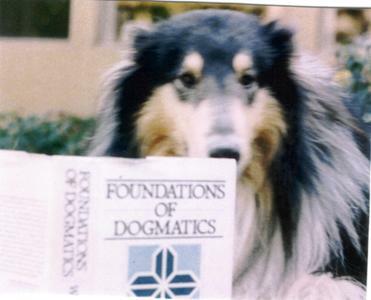 The foundations of Dogmatics are essential, yet annoying if you are a cat! We can master the entire Bible and even be totally transformed by the Word; but, if nothing comes from it, it is meaningless and nearly worthless. This is one of the main points of the book of James. Our faith must have a response to it. Yes, we may be saved, but what good is it if we do nothing with it? Does Your Church Buy into the Relativism of Your Culture? Does your church teaching or ministry model consider that Jesus is just a way but not the Way? He is to be THE Way, THE Truth and THE Life (John 14-15; Acts 4:12). What about teaching that there are no right or wrong absolutes, therefore neglecting morals and virtue? What about trying to be so careful not to offend anyone that we do not say anything to convict or to instruct? How can a person be challenged to grow if we do not redirect his or her path in love, and, when needed, call a spade a spade? What about the embracing of sin, saying it is OK in an attempt to show love and acceptance? This might include embracing homosexuality and saying it is OK. We are called to reach out to all those who are in any kind of sin, including homosexuals, but at the same time, we are not to accept the sin. We are to care and love and show them Christ without compromising morality or His precepts. What about failing to confront people in sin or to condemn the sins of our culture? We must live by example as well as point out errors—not only in our church but also in our society (Exodus 20:1-17; Rom. 1:16-32; 1 Cor. 6:9). We must be careful here, as we can easily slip off His Cornerstone and become a Church of Perfidy! Are you Watering Down His Word with Trends and the Ideas of Men? Perhaps not, you think. What about the preaching in your church? Is it Christ-centered or human-centered? Are you being seeker sensitive yet not communicating Christ’s Sovereignty and Lordship, His holiness and Supremacy (Col.1)? Are psychology and the over-use of illustrations and stories taking the place of expository preaching? There is nothing wrong with using the insights of science and behavioral science, as long as we come clean with the veracity of sin and personal responsibility. Are you just teaching popular topics that please people rather than going through the Scriptures verse by verse, thus not teaching? A church does not have to be liberal to water down the Word; it is done in conservative churches all of the time by the neglect of it! If your preaching is weak from a biblical standpoint, you have a Church of Perfidy!